Culture Whisper is an events site for all Londoners- planning what you see and do in London on a weekly basis. 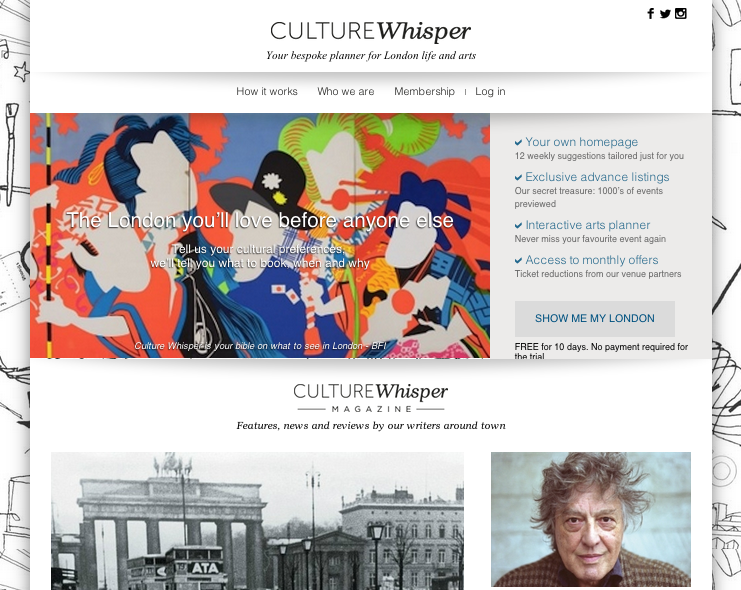 With the ability to create your own homepage tailored just to your hobbies and interests, Culture Whisper can help you find new sights, sounds and events in London, and even get you discounts on seeing them. Annual membership owners receive even better deals than monthly ones- but make sure you’ll use the site for that long before you get one! For members, Culture Whisper offers a lot of great content, made even better by the fact that it’s personally designed for you. Its varied articles, tailored experiences, and unique discounts can give you your money’s worth of London culture, and keep you occupied forever. For those not willing to splash the cash, however, the website can be a little bare: a few articles are all it has to offer. So if you’re willing to put in the pounds, this might help you rediscover London: otherwise, there are cheaper sites out there that can give you everything you need to find new arty places in the city. For more on art and culture events, see our page on Events and Gig Sites in London.